At Kennedy Wealth Management, retirement planning is the name of our game. We have helped more California clients than we can count with their retirement income plans, and among the many people we have served, there is almost always one commonality — people want help with their 401k. While a 401k is simple in concept, it’s much more difficult in execution, and there are, in fact, a lot of avoidable mistakes that are often made by well-intentioned workers who are trying to save. Fortunately, we have spent years and years studying the ins and outs of 401k plans, and we have the knowledge that can help you to get the most out of yours, based on the unique circumstances of your life. This is an easy mistake, and thankfully, one of the easiest ones to fix. You’ll want to consider where you want to be at retirement age, and how much you need to put away each month as a goal. Your target retirement income goal may vary based on your situation and post-retirement plans, but regardless of where it is, it’s important to understand how to get there. By having a target goal, you can do the math and figure out how much you need to deduct. If you’re not doing this, you might be putting away an arbitrary number that is not at all enough to get you where you need to be in 10 or 20 or 30 years. It may sting to deduct more from each paycheck, but trust us when we say it’ll all be worth it in the end — compound interest is your friend, and the money you put away now will be worth a whole lot more in the future. “Too little, too late” is an expression that can definitely apply to your 401k if you’re not careful. Even if you’re putting away a solid amount of your paycheck each pay period, it might not be enough if you’ve waited too long to start saving. Did you know that five years can be a difference of $400,000 in your retirement years? Due to the compounding effect of money, cash that you put away at a young age is much, much more valuable than cash you put away when you’re 30 or 40. Our advice is to start investing in your 401k right out of college. There is no reason to not be financially educated when you’re starting your career, and if you’re looking for a resource or a team of professionals who can help you make the right choices, look no further than Kennedy Wealth Management. If you work for a public company, you might have the option of investing in company shares as part of your 401k retirement plan. In theory, this isn’t a bad idea, especially because said shares are often offered as an enticing discount. However, have caution — investing in shares is fundamentally more risky than putting aside good old fashioned cash, and it can cost you if the company goes belly-up. It’s impossible to know where a company will be in multiple decades. Unforeseen technological advances can put entire industries out of business, scandals can cause corporate empires to crumble, and bad management decisions can cause stock values to plummet, even if the company itself never goes out of business. Let’s not forget there are still Blockbuster stores that exist in the single digits. Despite the fact that they haven’t ever completely died, no one is sitting around wishing they had bought more stock when it was cheap. Enron is an example of scandal destroying a company, where fraud brought the once-mighty company to its knees, ultimately resulting in bankruptcy. This is something that could not have been foreseen in any way by lower-level employees, and it’s a testament to the fact that even a company that has everything going for it can have skeletons in the closet. Sure, it would be nice to have invested in copious amounts of Google stock as a fledgling employee, but you’re probably not working for Google, and you have no idea what the future holds in store. For company stock in your 401k, a balanced approach is something we always recommend. Do we advise against investing in it entirely? Of course not — stock often does yield excellent results, but to put most of your eggs in that basket is foolhardy. When it comes to retirement, it’s better to be safe than sorry. Many employers offer to match your 401k contributions up to a certain percentage. This is a great thing, and one that you should unquestionably take advantage of. There is really no argument not to shoot for the maximum employer match. However, far too many people make the mistake of limiting their own contributions to that number. Unless you have a very high-income job, 401k contributions under 5% aren’t going to amount to much. Yes, it all adds up at the end of the day, but by paying just a little more every month, you can increase your retirement income by an order of magnitude. If your employer matches up to three percent of your 401k investing, that adds up to a grand total of six percent. Why not be more ambitious and shoot for a full 10 percent, offering seven percent yourself and letting your employer handle the rest? If you’re even more ambitious, you can throw in the full 10 percent yourself and think of your employer’s contribution as bonus income. Use your employer match as a helpful tool instead of making it your target goal. 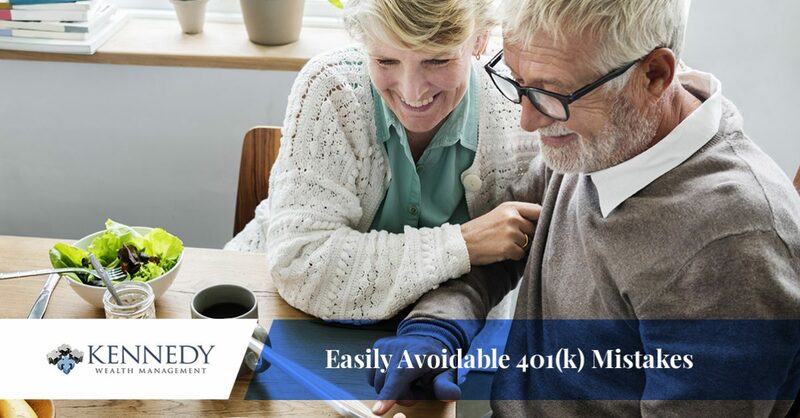 Finally, the biggest boon to your 401k is simply sitting down with a team of financial advisors, and getting a professional diagnosis of how you can maximize your 401k. When it comes down to it, financial professionals are aware of every little thing that could have an effect on your income, and are veritable experts in creating plans that illustrate clearly what your retirement will look like based on current savings. 401k plans aren’t the only thing that our team of financial advisors helps with. We can help you maximize your social security, develop better money saving and spending habits, and help you to make wise investments that will yield positive returns in the years where it really matters. We want to do everything we can to help you to have a retirement future that’s bright and optimistic. Kennedy Wealth Management, LLC., we have helped countless clients make the right choices with their 401k plan. No matter what your circumstances are, we promise that we’ll be able to make your situation better with our guidance and advice. It’s never too late to start saving on your 401k. Want to make the best choices regarding your future? Contact Kennedy Wealth Management today!